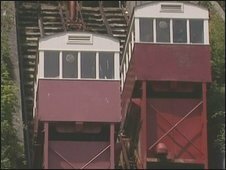 Work to restore a Victorian water-powered lift at Folkestone which closed last year is getting under way. The Grade II-listed Leas Lift on cliffs was built in 1885 and carried passengers for the last time on 30 June after Shepway council's lease ran out. It is one of the oldest water lifts in the UK and transported people between the sea front and the promenade. Its owner, Lord Radnor, said a company had been appointed to carry out repair work and it would reopen in June. He described it as a popular landmark which was being preserved for the benefit of the town. The work will involve the removal of the existing carriages to a specialist engineering works.